Last week, the Labor Department released disappointing productivity figures. Labor productivity has been falling for six months in the non-farm business sector. Multi-factor productivity (labor and capital combined) is barely growing. [i] In recent years, both have grown at a small fraction of their long run averages. Productivity matters because it is the source of wage growth over time. Wages raise when workers are able to produce more goods and services each hour they work. Rising productivity means more real output and higher incomes and living standards. Sluggish productivity growth is one of the reasons behind the lagging real wages of the past decade. The downdraft in productivity is not a merely a short term fluke related to a business cycle downturn. [ii] We are in an economic recovery, albeit a weak one. Meanwhile, the slowdown in productivity growth has been going on for more than ten years. A large part of the problem is bad federal policy. Economic and regulatory policies have a significant impact on capital formation and productivity. 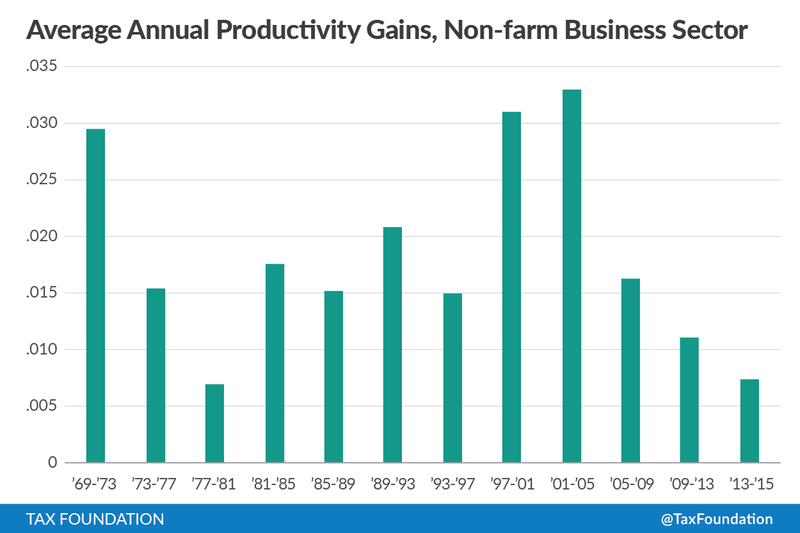 The following chart displays the average annual changes in productivity growth during presidential administrations since George H. W. Bush, lagged one year. The lag reflects the fact that a president’s policy initiatives can have little effect on the economy his first year in office, because it takes time to move the proposals through the Congress, and more time before the changes can influence real output. The last six years have seen the weakest growth in productivity since the Carter Administration, when the economy suffered from stagflation and “malaise,” and growth of the labor force was outstripping capital formation. Inflation began to creep up under Johnson and Nixon, but jumped sharply from 1975 under Ford and Carter. It drove up tax rates on labor (this was before the income tax brackets were indexed for inflation) and especially on capital, because the depreciation allowances in the income tax for the (rising) cost of plant and equipment were not adjusted for inflation. Many businesses were reporting and paying taxes on fictitious profits when they were really suffering losses. Today, we are suffering from an increasingly uncompetitive corporate tax rate, third highest in the world after Chad and the United Arab Emirates. We have a cost recovery (depreciation) system worse than two-thirds of the developed nations in the OECD (Organization for Economic Cooperation and Development). Recent individual income tax changes have increased the tax burdens on saving and investment. We are facing an ever-increasing list of burdensome federal regulations. These burdens make the United States an increasingly bad place in which to produce. After the release of the data, many pundits blamed the decline at least in part on sluggish investment, which is probably true. They diagnosed that the sluggish investment was due to poor sales prospects, due to inadequate consumer spending, or weak growth abroad hurting U.S. exports, or the strong dollar, all of which are presumed to reduce “aggregate demand.” Their proposed cure was government stimulus in the form of higher government spending on infrastructure or other Keynesian pump-priming measures to raise “demand.” This, they assert, would raise capacity utilization and boost investment. Going down the “demand” road leads to a dead end. Raising government spending does not boost demand, because the government must first take a dollar out of the economy by taxing or borrowing before it can spend it, if it is borrowing existing funds. If the Federal Reserve buys the new federal debt with new money, there can be an injection of spending, but at present, banks are holding the new money as reserves at the Fed, because loan demand is very low. So the Federal Reserve is holding down interest rates on federal debt, but low interest rates on federal debt do not boosting private investment. Policies aimed at manipulating demand have a long and consistent history of near total failure. It is time to think outside the Keynesian box. Businesses are not investing because they calculate that earnings from the investment will not be large enough, after taxes, to cover the cost of new plant and equipment or new commercial real estate and yield a reasonable return to the investors. The “service price” of new capital is too high. Well, if you can’t raise the bridge, lower the river. Instead of trying to boost demand for consumer goods, why not boost the supply of plant and equipment by lowering its cost? How can we lower the cost of investment? First, stop taxing fictitious profits. Allow full, immediate “expensing” of outlays for capital spending to reflect the full cost of the assets, instead of the current delayed depreciation allowances. Depreciation write-offs take years for equipment, and decades for buildings; they lose value to inflation and the time value of money, and never equal the full cost of the assets. Second, reduce the corporate tax rate. Those steps would raise expected returns, after taxes, and raise investment. They would make investment in the United States more profitable at any given level of “demand,” either from domestic or foreign buyers. As investment proceeds, the workers paid to produce the new capital will have more to spend, and when the added capital is in place, worker productivity and the supply of goods and services will be higher, real incomes will be higher, and people will “demand” more goods and services. That is Say’s Law in action. Be sure to make those changes permanent. The tax code currently allows partial (50%) expensing on a temporary basis, but it is currently due to be phased down and out by 2020. This practice of extending partial expensing for a brief time, as some sort of “counter-cyclical stimulus,” does not give businesses the certainty needed to build a new factory to house additional equipment that it may only be able to afford for one replacement cycle. We need permanent relief to generate a permanently higher stock of capital and permanently higher wages. This is not a matter of a temporary “stimulus” to tide the economy over a rough patch. The economy has not just fallen off its bicycle, only needing the government to help it up and give it a one-time shove. Rather, the economy is like a race horse that is being slowed down by being made to carry too much extra weight. Removing some of the lead weights from its saddle pocket for one lap around the track will not make it run faster for the whole race, let alone all future races. Government is saddling the private sector with taxes that are too high and regulations that are too burdensome. These drags on performance must be lightened permanently if we are to have a bigger capital stock and a more productive, and better-paid labor force. [i] On May 4, the Bureau of Labor Statistics reported that non-farm business sector labor productivity decreased at a 1.0-percent annual rate during the first quarter of 2016. This followed a revised drop of 1.7 percent in the fourth quarter of 2015. Year-over-year, from the first quarter of 2015 to the first quarter of 2016, productivity increased 0.6 percent. By comparison, the average gain from 1987-2015 was 2.0 percent. On May 5, the BLS reported equally gloomy numbers for multi-factor productivity, which measures the output of the combined input of capital and labor, and which captures technological advances and other influences. That index rose at a 0.2-percent annual rate in the non-farm business sector, down from the 2007-2015 average of 0.4 percent. Over the period 1987-2015, multi-factor productivity averaged growth of 0.9 percent, with the highest average annual gains of 1.5 percent from 1995 to 2000 and 1.4 percent from 2000 to 2007. 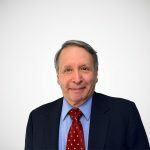 [ii] Productivity often falls as the economy moves into an economic downturn, when businesses try to hold onto labor in the hope that the drop in production will be short-lived.